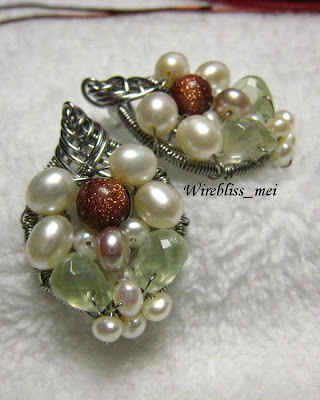 After few days of inactivity, I finally managed to complete this pair of earrings today. 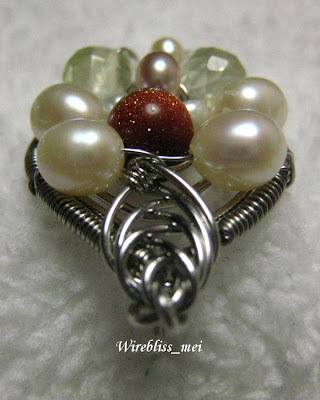 This piece is based on Corra's Wired Chinese Knot that I mentioned the other day. Took me whole afternoon to make this. While wrapping the goldstone, pearls and lime colored gem (not sure what stone this is but I love the color, must check with the expert later! 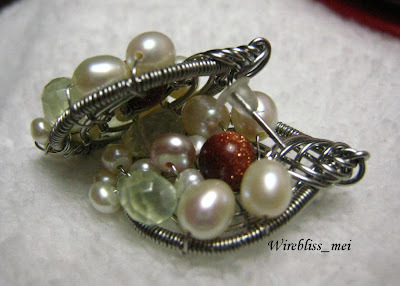 ), I really have no idea where it was going and I can't stop thinking that I would not be able to make the other pair. Phew! They turned up quite ok in the end. This post earrings measure about 3cm x 2cm. Maybe this piece will be my first etsy piece. Yeah! Am planning to start selling on line this time around. Wish me luck then and will keep you posted on my etsy store. Hopefully soon! Mei these are gorgeous! I'd definitely buy them if you had 'em on sale...such pretty colours! Thank you. My Etsy shop is opened today. Please come and visit although I am still in the process of filling it up. You are just amazing. I love your jewelry and this piece, like the others, is just stunning.